Equine castration is the most common surgical procedure performed on horses. Not only does it prevent unwanted breeding, but it can also dramatically improve the behavior and management of your horse. 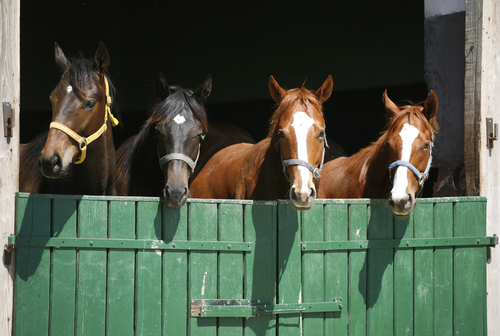 When should equine castration take place? 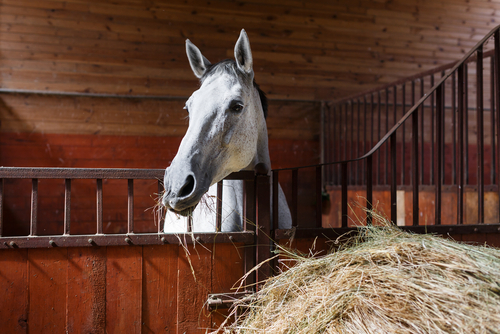 Equine castration usually takes place in either the spring or autumn months in order to avoid bacteria-carrying flies in the summer and the mud of winter. Traditionally, castration is carried out in a horse’s yearling year, but there is no reason why the procedure cannot be undertaken at other times. However, both testicles must have descended into the scrotum before the castration takes place. If one testicle is undescended, then waiting to castrate is usually the most viable option. However, it is possible to carry out a full castration via laparoscopy to find the retained testicle, although this requires much more surgical intervention and therefore a longer recovery period. Your equine veterinarian will obtain the medical history and conduct a thorough examination of your horse before performing castration, to ensure that he is in good condition, has been wormed regularly, his vaccinations are up to date and he has not suffered any recent respiratory infection. Castration can be achieved in two ways. Which is right for your horse will be dependent on his age, size, and temperament, among other factors. Your equine veterinarian will be able to advise which is most suitable for your animal. Open castrations are the most popular method of this procedure and they can be performed by an experienced and qualified equine veterinarian in the usual environment of your horse. Depending on the size and temperament of your horse, the procedure may be carried out under heavy sedation, a local or general anesthetic. In some cases, it is possible to castrate a horse while they are stood, but this is only undertaken in extremely laid-back and well-managed equines. During open castration, one incision is made over each testicle, but rather than being closed with sutures, they are left open so that they can drain and heal freely. Closed castrations must be performed under sterile conditions at your equine veterinarian’s surgery and under a general anesthetic. While the procedure is the same, in a closed castration the wounds are sealed using sutures. This significantly reduces the likelihood of hemorrhaging, but the wounds are unable to drain as well as those in open castrations and many horses will develop reasonable swelling at the castration site in the days or even weeks after the operation. During the recovery period, most equine specialist veterinarians will recommend that your horse gets some light exercise every day. This will encourage the wound to drain and minimize any swelling. If you have a paddock, then your horse should be left to move around as normal. However, if your horse is stabled then he should be walked out 3 or 4 times a day for at least ten minutes each time. All horses are given post-operative antibiotics and pain relief for the procedure. Your veterinarian may provide your animal with a prescription for some follow-on pain relief as he recovers from his castration. Infections Castrations are usually carried out during spring and autumn to avoid some of the infection risk posed by flies during summer and mud during winter. Some infections can be picked up during the surgery itself, regardless of how clean the environment where the castration takes place is. Your veterinarian will ensure that maximum hygiene is achieved regardless, in the hope to minimize any infection risk. Post-operative bleeding This is more common in open castrations, but can occur in either case. A little blood is usually of no concern, but if your horse experiences a constant stream of blood or you are concerned about excessive bleeding then make immediate contact with your equine veterinarian. Swelling Some swelling after castration is completely normal, and this may increase until around five days’ post-operation when it should reach its peak. Gentle daily exercise is recommended to help minimize swelling. Hernia Herniation of the abdominal contents through the wound. This is much more common in open castrations and castration of foals. However, the risk can be minimized by using the closed technique of castration instead. Reaction to anesthetic The use of anesthetic always carries some risk with it, but your equine will be given a pre-anesthesia examination to ensure they are low-risk of an adverse reaction. Sparrow Ln will be closed, as well as the new Neon Rd for several weeks. You will have to come from the south on Ambassador (which will be re-opened). sits on coming off of Wells By Pass. Please do not hesitate to call if you have any questions.